1. Using recycled materials whenever and wherever feasible. 2. Using organically or sustainably produced materials, when recycled are not feasible. 3. Constantly working with the manufacturers we get our products from to improve their production methods. 4. Creating toys that are non-violent and have a socially responsible message such as peace, protecting the environment and diversity. 5. Offsetting the non-environmental impact the materials in our toys whenever we can not find or produce these toys environmentally. We will set aside 20% of the revenues from the sale of these products. Use this to develop the toys in more environmental methods, donatations to environmental, educational, and social organizations or to purchase carbon, sulphur, and other offsets (like planting trees).The Hugg-A-Planet Line is another example of our philosophy at work. 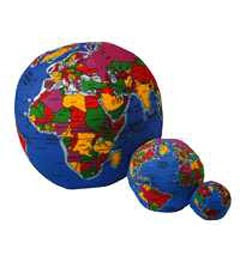 The planets are stuffed with recycled fibers and impart a positive caring message for the planet. We also carry a line of earth marbles made from recycled glass.” When we purchased our Hugg-a-Planet, they were only available from green retailers. I am pleased to see Hugg-a-Planet offered in mainstream outlets now, including school catalogs. Hugg-a-Planet makes a great gift too! Eco Child’s Play will be offline for a few days. We have to take our son to the pediatric dental services at UCSF. Our regular posts should return Wednesday, unless immediate care is needed for our sweet boy. Please keep positive space and prayers for our son!